The March College Basketball Tournament is upon us and very soon people all over the country will be feverishly studying, filling out their brackets, guessing who will win it all, and then second guessing their first guesses. When my bracket, in the office competition, won it all for the first time, it took a little bit of homework beforehand. However it also took great endurance and a little luck during the home stretch. It came down to me and one other person in the finals. They had picked Arizona to win it all and Arizona happened to have a down year. I had pored over my teams each round and memorized each possible scenario. I was needing a few points going into the final game, so it was win the championship or go home. That game and the whole office competition was stressful. In the end, I came out victorious. Although this isn't one of the most important moments in my life, whenever I have an argument about sports at the office, I can always play the "my bracket beat yours" card. "Bracket Glory" like that can never be taken away. Just as important as the final results are how you get to experience the tournament. Will you have some parties, constantly talking trash to your friends as you watch endless hours of basketball? Will you sneak time at the office, watching the games online as you make a futile attempt to be productive? Or will you just track the final scores, shedding tears over each "Cinderella" team that knocks out your championship contenders? What you need to realize is that no matter how you celebrate this March craziness, it is a marathon, not a sprint. In order to have the strength to make it through, you must keep yourself and your friends well fed. What better way to do that than with meal options that can be eaten at any time of day? These college basketball games start in the morning and go until late and this recipe will taste terrific no matter what time you are enjoying it. Breakfast is just as tasty at 7 pm as it is at 7 am. One of the great things about my simple recipe is that most of the ingredients can be picked in the freezer section of your local store, including the perfectly ripe fruit you see in the yogurt bowl above! There is so much variety in frozen foods today. You can find all sorts of foods ranging from healthy vegetables to amazing desserts. Frozen foods today are captured at the height of freshness and prepared by incredible chefs. Best of all they can be very convenient to prepare and come in portions perfect for you. The freezer aisle is filled with simple, customizable, and affordable meals and snacks. This includes this incredible recipe for "Bracket Buster Breakfast Sliders." Before you start you need to know that this recipe is completely customizable to your needs. You can prepare it as an appetizer for adults and kids, or using the same ingredients, you can prepare a meal to feed someone with a championship level hunger. Apps or meal, the choice is yours. Whatever decision you make you should also choose to enter #FrozenChefMadness challenge from LifeOfDad.com and EasyHomeMeals.com. Because even if you don't win with your bracket this year, you could win a great cash prize with your recipe! March is "Frozen Food Month" and to celebrate they are giving you an $800 gift card if you win. You just for submit your appetizer/prepared snack food recipe and share it on social media. Go to Life of Dad HERE to enter to win an $800 gift card and for full instructions. There is also a Twitter party coming up where you can win even more prizes! Good luck in the contest and with your bracket. 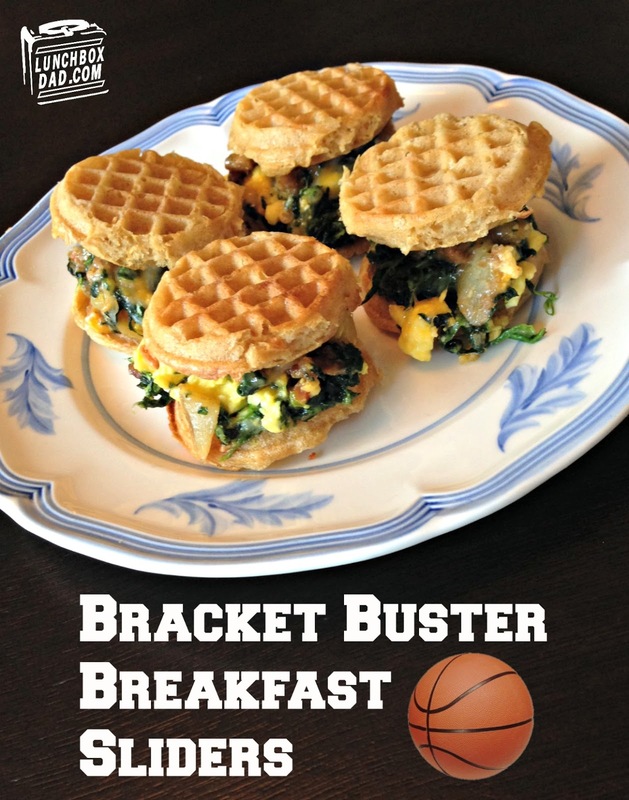 But even if your bracket gets busted by a few "Cinderella" teams, at least you can enjoy this "Bracket Buster Breakfast." This recipe will make two full size sandwiches or eight sliders. It is so simple and fast because most of it can be made in your microwave and toaster so you can spend less time in the kitchen and more time watching the game. You can also make this "light" by substituting in Eggo Whole Grain Waffles and the Jimmy Dean Delights Breakfast Bowl. 1. Heat up Green Giant spinach in microwave according to package instructions. Remove hot spinach from package and use paper towel to remove excess moisture. 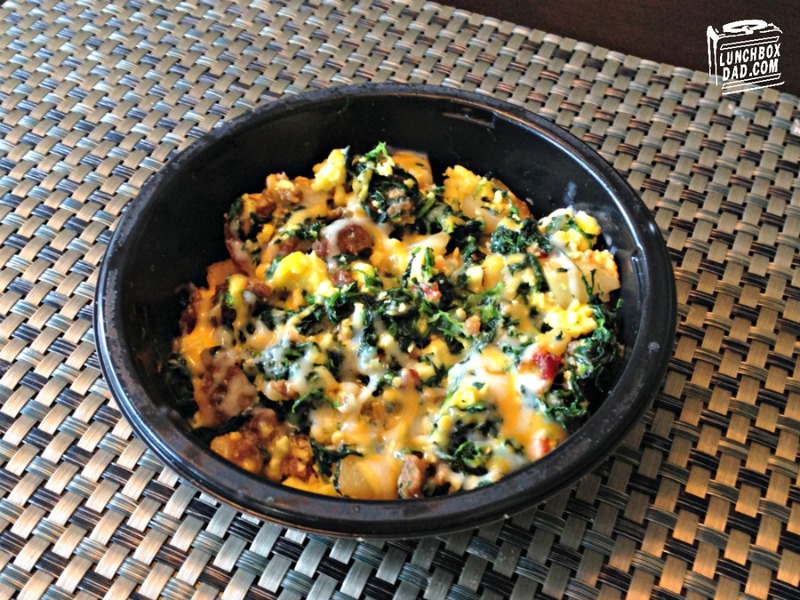 While you are doing this, heat up Jimmy Dean Breakfast Bowl for two minutes in microwave. 2. After two minutes, remove plastic from Jimmy Dean bowl as stated. Put in desired amount of spinach (I use about 1/4 of the package) and shredded cheese. The bowl has some cheese in it already but since this bowl will be used as filling, I put in a bit more cheese to hold everything together. Put it all back in microwave for another 1 1/2 minutes. When done it should look similar to the picture on the above. 3. Toast Eggo Waffles (Waffle Bites or Full-Size) in your toaster until golden brown. Remove from toaster and put desired amount of filling on one waffle. Pour a small amount of maple syrup on top of filling. You will want enough to taste it but not enough to drown the sandwich. The perfect amount will provide both a sweet and savory taste that, along with the crunch of the waffle, will dazzle your taste buds and have your friends begging for more. 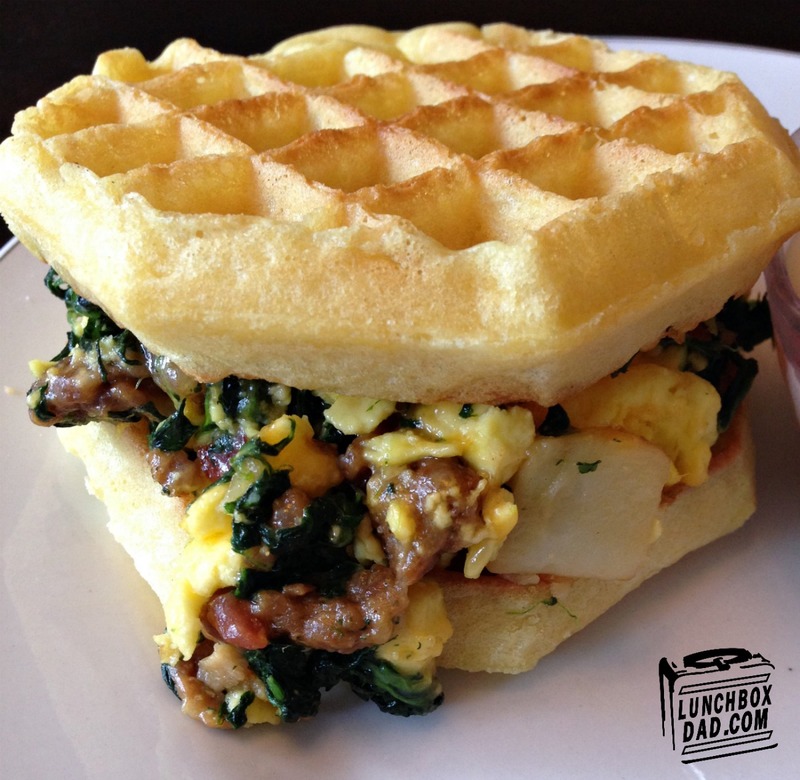 Place second waffle on top to make sandwich. 4. 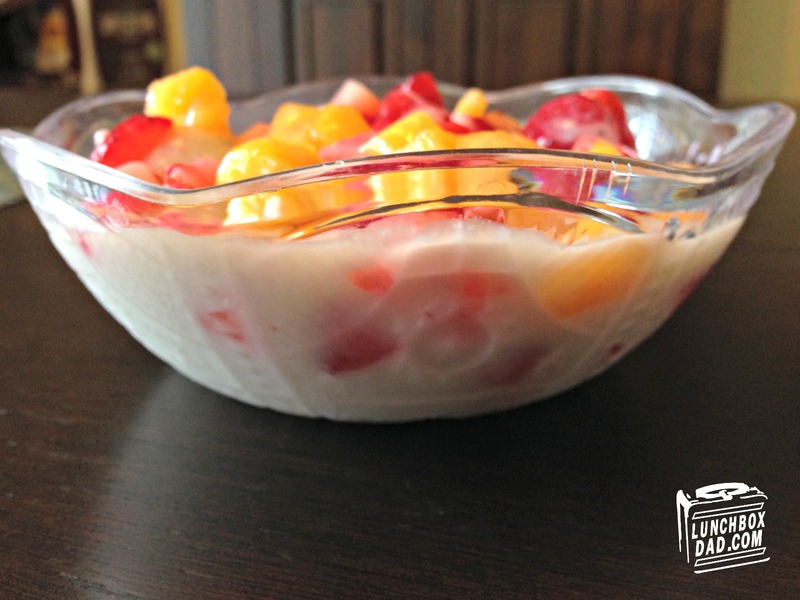 For a healthy and delicious side dish, spoon a generous amount of Dole Ready-Cut frozen fruit on top of your favorite yogurt. You can defrost the fruit first in the microwave or serve it frozen, it is up to you. The chunks are small and are the perfect size to serve right out of the bag, so you don't need to spend any time cutting it! 5. The last step is to enjoy your appetizer and the game. Your man-size meal only took a couple of minutes to prepare so that should leave plenty of time to talk trash to your friends and enter the LifeOfDad.com and EasyHomeMeals.com #FrozenChefMadness challenge. Remember to go to LifeOfDad.com HERE to enter and get all the rules and instructions. 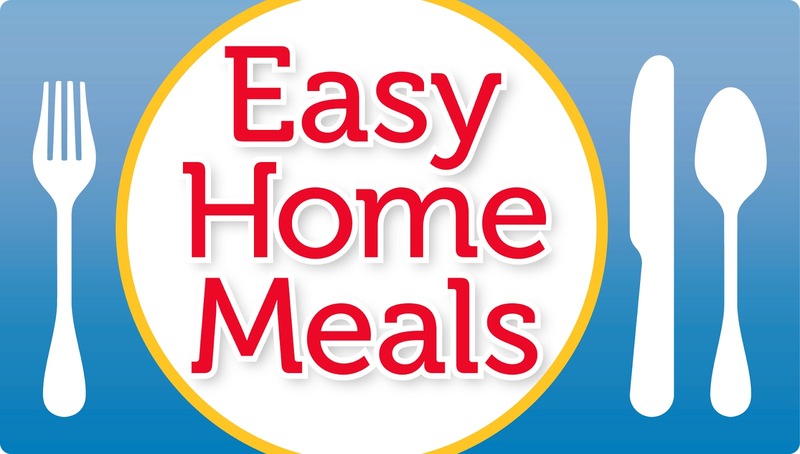 Also check out Easy Home Meals on Facebook, Twitter, and Pinterest. This recipe is a winner for kids and adults alike. If you don't believe me, just look at my son below enjoying his own "Bracket Buster Breakfast Slider." 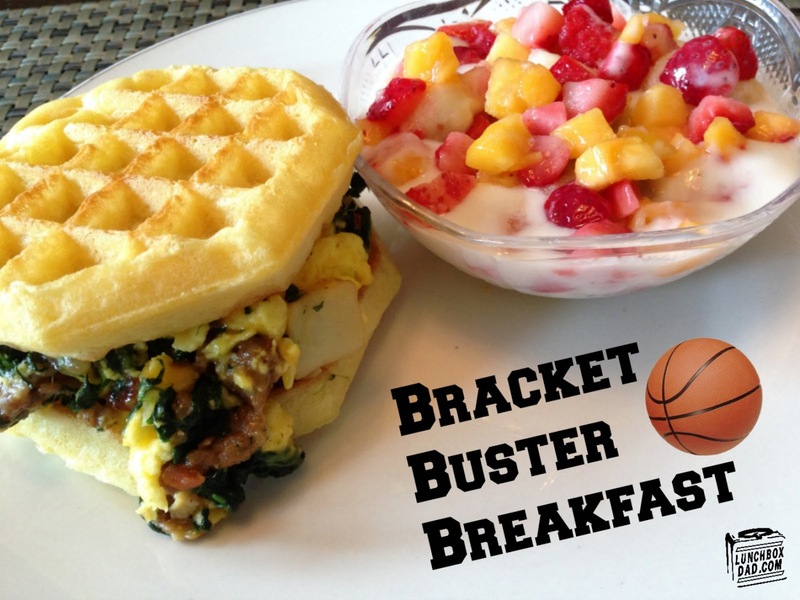 Have a great tournament and go for the "Bracket & Breakfast Glory!" 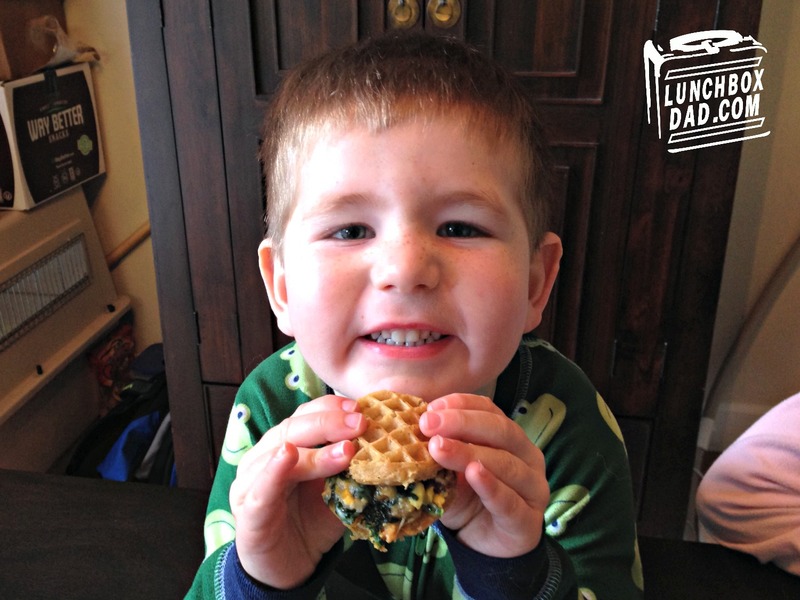 *I have partnered with Life of Dad, LLC for the #FrozenChefMadness promotion. Sponsored by NFRA ( https://www.nfraweb.org/), the #FrozenChefMadness promotion gives anybody the chance to win a $800 Visa gift card. LOVE these breakfast sliders! Fantastic job! Thanks, my whole family loved them!